Don’t miss our March Madness Match at Waterside Arts this month! This month you don’t just decide which team wins each game… you decide who the teams are and what games they play! That’s right – this month we’re handing you all the power (well, almost, we still have our referee) as we’ll pick two audience volunteers to become team managers. It’ll be their responsibility to pick the teams and give inspirational advice to keep morale high. Our referee will also get you the audience to pick all of the games that are played that night. Who wins? You decide that too! Our March Madness Match Managers from 2017! Mar 16th, 3pm – ComedySportz 4 Tots, Waterside Arts, Sale. More BIG laughs for little kids with plenty of silly songs and stories. Join us for an afternoon of laughter and fun for kids aged 6 and under. £5/3. Book online or via venue box office. Mar 16th, 6.30pm – ComedySportz, Waterside Arts, Sale. March Madness Match! This totally unpredictable, totally unscripted competitive comedy show just got even more unpredictable and unscripted. Is that even possible? There’s only one way to find out! £7/5. Book online or via venue box office. Mar 30th, 6pm – ComedySportz, The Way Theatre, Atherton. Two teams battle it out for your laughs with quick-witted gags, games, sketches and songs. All inspired by your suggestions! £8/5. Book online or via venue box office. Fun loving Improv troupe seeks audience with GSOH of humour and long walks in the park this month… If that sounds like you then we’ve got lots going on this month to keep you and your family entertained during the half-term break! 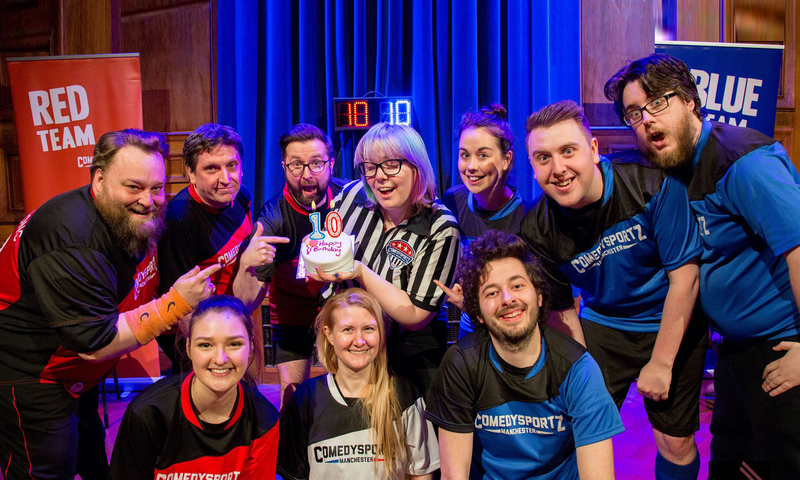 We’re back at Waterside Arts 16th February with ComedySportz 4 Tots and our ComedySportz Valentine’s Special! ComedySportz 4 Tots is our show for ages 6 and under with plenty of BIG laughs for little kids. There will be plenty of opportunities for kids and adults alike to get involved with all the silly songs, stories and games. Then love will be in the air as our teams battle it out for your affections in our Valentine’s Special show with plenty of themed games! Who wins? You decide! If that wasn’t enough for you then we’re back at Ramsbottom Civic Hall (16th February) and The Way Theatre, Atherton (23rd February) for more all action, all improvised competitive comedy. We’re delighted to be back at these exciting new venues – book your tickets now! Think you might want to try your hand at Improv or looking for an alternative valentine’s day gift for your special someone – or even as a couple)? There are only a few spaces left on our next 8 week batch of workshops in Improvisation and Stand Up. Visit our workshops page or drop us an email to enquire about booking a space on one of our workshops as a gift. We wish you a very Merry Christmas and a fantastic New Year from all the team at ComedySportz Manchester. We hope you have very happy holidays and we can’t wait for what 2019 will bring with even more shows and classes! Whether you’re looking for a last minute Christmas gift or already thinking about your New Years Resolutions there is still time to sign up for our 2019 workshops! Finally, if you’re looking for something to do with the family over Christmas we have two shows at The Piece Hall in Halifax on Saturday 22nd and Thursday 27th December. Book tickets here. A special thank you to everyone that came to our Birthday shows at Waterside Arts and Chorley Little Theatre. Everyone had lots of fun and we got plenty of weird and wonderful suggestions and very funny audience volunteers. We’re approaching the end of 2018 but we still have a few shows left before the year is out. Tickets are going fast for our Improvised Pantomimes in December and we’ll be doing two special ComedySportz shows at The Piece Hall in Halifax.